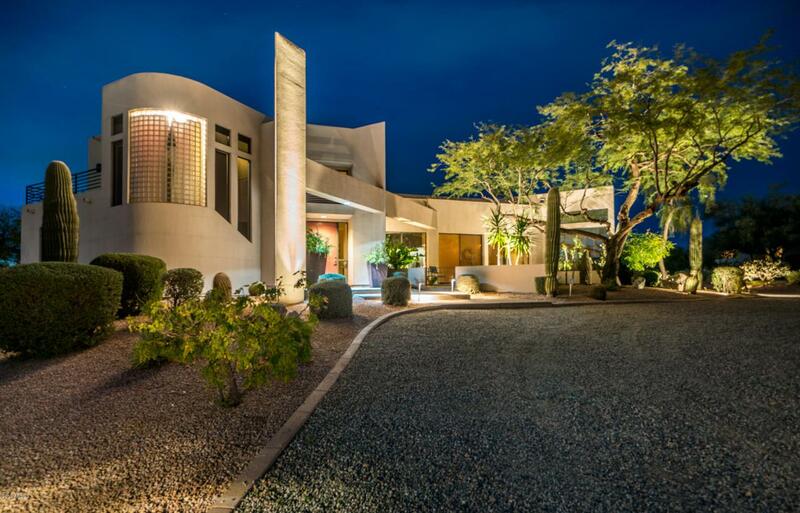 Stunning custom contemporary luxury home situated on over an acre view lot in prestigious Scottsdale location. Interior brings the outside in with expansive windows/doors & provides a very open feel & perfect for showcasing art . Epicurean kitchen with exquisite granite counter with onyx backsplash that opens to the living area. Secluded master bedroom retreat with hardwood floors & balcony that overlooks mountain & sunset views. Private theater room with sound proofing walls at the back of the home. 3 other very ample size bedrooms and a bonus loft room. Exterior has both front courtyard & backyard fire pits. Pebble tec pool with water fall, built in bbq with breathtaking views & privacy. Truly a unique & spectacular property that makes an impression on you the moment you drive up! Listing courtesy of Evolve Realty, Llc.